Workshop: Home School Tidy Up Collaging with artist Angela Baum. ‘Join in the Conversation’ Artists Lou Baker & Fiona Campbell discuss their practice as a performative conversation. ‘Glut’ (2018) is an outpouring. Its title is a play on the lexical for gluttony and gut, also referring to ‘gut response’. 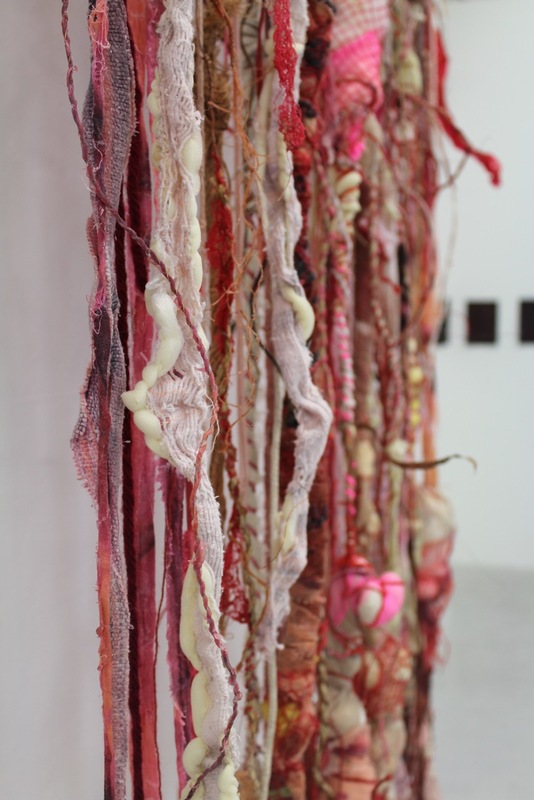 A ‘curtain’ of tentacular entrails, amorphous bodily forms, viscous hybrids transformed, suturing trash into treasure, ‘Glut’ is seductive and disgusting. The materials (especially personal items) speak of past lives, loss, textiles, craft. In contrast, the organic forms symbolise death, violence, but also vulnerability and renewal - the duality of horror and tenderness. is a multi-site exhibition consisting of 23 artists and the Walking the Land Artists collective responding to the fire of industrial incinerators & combustion fallout on human & more than human ecosystems. Submissions open on Friday 1 February and close on Sunday 31 March. The sell out SSS events are moving to the Cotswolds Players, where the ten selected stories will be read by their authors on Sunday 19 May. This work came about as a result of two years research which began with the question “how do parents take their children to school and why do they choose to travel this way?” Safe and independent travel to school for young people is a major issue across the UK and our roads have become congested pollution hot spots due to a culture of car dependency. Data from the research became important but was hard to visualise. The research involved my local community and somehow I wanted to give the data back in a form that was not just another academic document with graphs and tables. Homma’s ‘fire etchings’ are sepia-coloured silhouettes of idyllic pastoral scenes featuring strange industrial buildings like nuclear reactors and incinerators that are barely visible in the midsts of a nature setting. Japan-born Kaori Homma responds to the 2011 Fukushima nuclear ‘fallout’ and its subsequent communication freeze as the shadows of contamination and silence envelop the disaster zone. The sea water that cools the active nuclear core which has yet to be precisely located is diverted straight back into the Pacific Ocean. Kaori Homma will speak at Incendiary, Lansdown Gallery on February 4th 2019. Incinerators continue to be designed, constructed and fired up. They conjure images of Dante’s burning Inferno and are persistent despite much public protest and debate. Hyper consumption, over-packaging and waste fire this inferno-incinerator phenomenon. Conjuring the destructive power of elemental fire, the industrial pyre borrows from a powerful fire / regeneration binary association found in various mythologies often connected with the hope of transformation in the face of destruction. However, the fire / regeneration narrative that the modern world faces has acquired an urgency as things heat up. This exhibition considers the environmental hazards lingering and merging with human and non-human ecosystems. Are there other more suitable narratives for social and cultural shifts in response to climate change? How can art contribute to political dialogue and inspire resistance? Artists are invited to submit work in response to the incinerator opening in Gloucestershire early 2019, or more generally, the stubborn use of incinerators to burn waste on a global scale. The exhibition will be located in different sites around Stroud in early February 2019 and will include digital, moving image, textile art, installation, photography, sculpture & painting media. Artists are invited to submit proposals for 3D / 2D, installation, digital and textile art media.